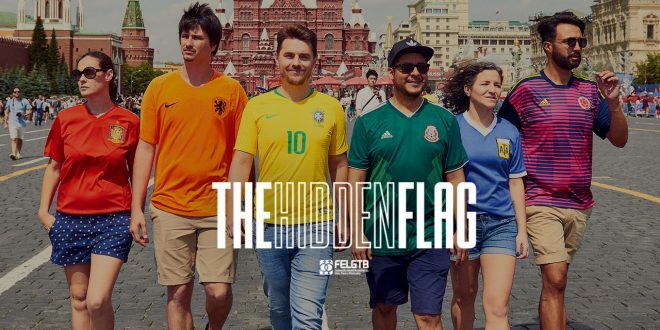 LGBT Activists Display "Hidden Flag" At World Cup - Joe.My.God. When Gilbert Baker designed the rainbow flag in 1978, he did so to create a symbol and an icon for the LGTB community. A symbol, recognisable across the world, that people could use to express their pride. Unfortunately, 40 years later, there are still countries in which homosexuality is persecuted, sometimes even by jail sentences, and in which the rainbow flag is forbidden. Russia is one of these countries. Because of this, we have taken advantage of the fact the country is hosting the World Cup at the same time as Pride Month, to denounce their behaviour and take the rainbow flag to the streets of Russia. Yes, in the plain light of day, in front of the Russian authorities, Russian society and the whole world, we wave the flag with pride. How? In a way that no one would ever suspect. Football shirts. Spain, The Netherlands, Brazil, Mexico, Argentina and Colombia. Six countries. Six brave LGBT activists, that together, form the flag that toured around iconic sites in Russia, traveling to every corner to fight against a struggle that will never be silenced.